Further development of quantum emitter based communication and sensing applications intrinsically depends on the availability of robust single-photon detectors. Here, we demonstrate a new generation of superconducting single-photon detectors specifically optimized for the 500–1100 nm wavelength range, which overlaps with the emission spectrum of many interesting solid-state atom-like systems, such as nitrogen-vacancy and silicon-vacancy centers in diamond. The fabricated detectors have a wide dynamic range (up to 350 million counts per second), low dark count rate (down to 0.1 counts per second), excellent jitter (62 ps), and the possibility of on-chip integration with a quantum emitter. In addition to performance characterization, we tested the detectors in real experimental conditions involving nanodiamond nitrogen-vacancy emitters enhanced by a hyperbolic metamaterial. M. J. Burek, Y. Chu, M. S. Z. Liddy, P. Patel, J. Rochman, S. Meesala, W. Hong, Q. Quan, M. D. Lukin, and M. Lončar, “High quality-factor optical nanocavities in bulk single-crystal diamond,” Nat. Commun. 5, 5718 (2014). N. P. de Leon, B. J. Shields, C. L. Yu, D. E. Englund, A. V. Akimov, M. D. Lukin, and H. Park, “Tailoring light-matter interaction with a nanoscale plasmon resonator,” Phys. Rev. Lett. 108, 226803 (2012). Y. Chu and M. D. Lukin, “Quantum optics with nitrogen-vacancy centers in diamond,” https://arxiv.org/pdf/1504.05990 . J. Lin, J. P. B. Mueller, Q. Wang, G. Yuan, N. Antoniou, X. C. Yuan, and F. Capasso, “Polarization-controlled tunable directional coupling of surface plasmon polaritons”, Science 340, 331–334 (2013). D. Chanda, K. Shigeta, T. Truong, E. Lui, A. Mihi, M. Schulmerich, P. V. Braun, R. Bhargava, and J. A. Rogers, “Coupling of plasmonic and optical cavity modes in quasi-three-dimensional plasmonic crystals,” Nat. Commun. 2, 479 (2011). D. K. Gramotnev and S. I. Bozhevolnyi, “Nanofocusing of electromagnetic radiation,” Nat. Photonics 8, 13–22 (2013). S. Fan, “Nanophotonics: Magnet-controlled plasmons,” Nat. Photonics 4, 76–77 (2010). M. W. Doherty, N. B. Manson, P. Delaney, F. Jelezko, J. Wrachtrup, and L. C. Hollenberg, “The nitrogen-vacancy colour centre in diamond,” Phys. Rep. 528, 1–45 (2013). P. C. Maurer, G. Kucsko, C. Latta, L. Jiang, N. Y. Yao, S. D. Bennett, F. Pastawski, D. Hunger, N. Chisholm, M. Markham, D. J. Twitchen, J. I. Cirac, and M. D. Lukin, “Room-temperature quantum bit memory exceeding one second,” Science 336, 1283–1286 (2012). L. Robledo, L. Childress, H. Bernien, B. Hensen, P. F. A. Alkemade, and R. Hanson, “High-fidelity projective read-out of a solid-state spin quantum register,” Nature 477, 574–578 (2011). H. Bernien, B. Hensen, W. Pfaff, G. Koolstra, M. S. Blok, L. Robledo, T. H. Taminiau, M. Markham, D. J. Twitchen, L. Childress, and R. Hanson, “Heralded entanglement between solid-state qubits separated by three metres,” Nature 497, 86–90 (2013). B. J. M. Hausmann, B. J. Shields, Q. Quan, Y. Chu, N. P. De Leon, R. Evans, M. J. Burek, A. S. Zibrov, M. Markham, D. J. Twitchen, H. Park, M. D. Lukin, and M. Loncǎr, “Coupling of NV Centers to photonic crystal nanobeams in diamond,” Nano Lett. 13(12), 5791–5796 (2013). L. J. Rogers, K. D. Jahnke, M. H. Metsch, A. Sipahigil, J. M. Binder, T. Teraji, H. Sumiya, J. Isoya, M. D. Lukin, P. Hemmer, and F. Jelezko, “All-optical initialization, readout, and coherent preparation of single silicon-vacancy spins in diamond,” Phys. Rev. Lett. 113, 263602 (2014). C. Hepp, T. Müller, V. Waselowski, J. N. Becker, B. Pingault, H. Sternschulte, D. Steinmüller-Nethl, A. Gali, J. R. Maze, M. Atatüre, and C. Becher, “Electronic structure of the silicon vacancy color center in diamond,” Phys. Rev. Lett. 112, 036405 (2014). I. I. Vlasov and et al., “Molecular-sized fluorescent nanodiamonds,” Nat. Nanotechnol. 9, 54–58 (2014). D. Englund, A. Majumdar, M. Bajcsy, A. Faraon, P. Petroff, and J. Vučković, “Ultrafast photon-photon interaction in a strongly coupled quantum dot-cavity system,” Phys. Rev. Lett. 108, 093604 (2012). A. Bazin, K. Lenglé, M. Gay, P. Monnier, L. Bramerie, R. Braive, G. Beaudoin, I. Sagnes, R. Raj, and F. Raineri, “Ultrafast all-optical switching and error-free 10 Gbit/s wavelength conversion in hybrid InP-silicon on insulator nanocavities using surface quantum wells,” Appl. Phys. Lett. 104, 011102 (2014). J. Wrachtrup and F. Jelezko, “Processing quantum information in diamond,” J. Phys-Condens. Mat. 18, S807–S824 (2006). L. Childress and R. Hanson, “Diamond NV centers for quantum computing and quantum networks,” MRS Bull. 38, 134–138 (2013). G. Kucsko, P. C. Maurer, N. Y. Yao, M. Kubo, H. J. Noh, P. K. Lo, H. Park, and M. D. Lukin, “Nanometre-scale thermometry in a living cell,” Nature 500, 54–58 (2013). J. M. Taylor, P. Cappellaro, L. Childress, L. Jiang, D. Budker, P. R. Hemmer, A. Yacoby, R. Walsworth, and M. D. Lukin, “High-sensitivity diamond magnetometer with nanoscale resolution,” Nat. Phys. 4, 810–816 (2008). J. R. Maze, P. L. Stanwix, J. S. Hodges, S. Hong, J. M. Taylor, P. Cappellaro, L. Jiang, M. V. G. Dutt, E. Togan, A. S. Zibrov, A. Yacoby, R. L. Walsworth, and M. D. Lukin, “Nanoscale magnetic sensing with an individual electronic spin in diamond,” Nature 455, 644–647 (2008). D. Le Sage, K. Arai, D. R. Glenn, S. J. DeVience, L. M. Pham, L. Rahn-Lee, M. D. Lukin, A. Yacoby, A. Komeili, and R. L. Walsworth, “Optical magnetic imaging of living cells,” Nature 496, 486–489 (2013). N. Bar-Gill, L. M. Pham, A. Jarmola, D. Budker, and R. L. Walsworth, “Solid-state electronic spin coherence time approaching one second,” Nat. Commun. 4, 1743 (2013). J. Wolters, A. W. Schell, G. Kewes, N. Nüsse, M. Schoengen, H. Döscher, T. Hannappel, B. Löchel, M. Barth, and O. Benson, “Enhancement of the zero phonon line emission from a single nitrogen vacancy center in a nanodiamond via coupling to a photonic crystal cavity,” Appl. Phys. Lett. 97, 141108 (2010). A. Faraon, P. E. Barclay, C. Santori, K. M. C. Fu, and R. G. Beausoleil, “Resonant enhancement of the zero-phonon emission from a colour centre in a diamond cavity,” Nat. 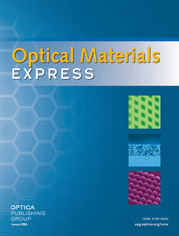 Photonics 5, 301–305 (2011). T. B. Hoang, G. M. Akselrod, C. Argyropoulos, J. Huang, D. R. Smith, and M. H. Mikkelsen, “Ultrafast spontaneous emission source using plasmonic nanoantennas,” Nat. Commun. 6, 7788 (2015). M. Y. Shalaginov, V. V. Vorobyov, J. Liu, M. Ferrera, A. V. Akimov, A. Lagutchev, A. N. Smolyaninov, V. V. Klimov, J. Irudayaraj, A. V. Kildishev, A. Boltasseva, and V. M. Shalaev, “Enhancement of single-photon emission from nitrogen-vacancy centers with TiN/(Al, Sc) N hyperbolic metamaterial,” Laser Photonics Rev. 9, 120–127 (2014). A. V. Kildishev, A. Boltasseva, and V. M. Shalaev, “Planar photonics with metasurfaces,” Science 339, 1232009 (2013). T. Wolf, P. Neumann, K. Nakamura, H. Sumiya, T. Ohshima, J. Isoya, and J. Wrachtrup, “Subpicotesla diamond magnetometry,” Phys. Rev. X 5, 041001 (2015). L. Rogers, K. Jahnke, T. Teraji, L. Marseglia, C. Müller, B. Naydenov, H. Schauffert, C. Kranz, J. Isoya, L. McGuinness, and F. Jelezko, “Multiple intrinsically identical single-photon emitters in the solid state,” Nat. Commun. 5, 4739 (2014). J. Wang, F. Feng, J. Zhang, J. Chen, Z. Zheng, L. Guo, W. Zhang, X. Song, G. Guo, L. Fan, C. Zou, L. Lou, W. Zhu, and G. Wang, “High-sensitivity temperature sensing using an implanted single nitrogen-vacancy center array in diamond,” Phys. Rev. B 91, 155404 (2015). I. V. Fedotov, S. Blakley, E. E. Serebryannikov, N. A. Safronov, V. L. Velichansky, M. O. Scully, and A. M. Zheltikov, “Fiber-based thermometry using optically detected magnetic resonance,” Appl. Phys. Lett. 105, 261109 (2014). G. N. Gol’tsman, O. Okunev, G. Chulkova, A. Lipatov, A. Semenov, K. Smirnov, B. Voronov, A. Dzardanov, C. Williams, and R. Sobolewski, “Picosecond superconducting single-photon optical detector,” Appl. Phys. Lett. 79, 705 (2001). C. M. Natarajan, M. G. Tanner, and R. H. Hadfield, “Superconducting nanowire single-photon detectors: physics and applications,” Supercond. Sci. Tech. 25, 63001 (2012). M. V. Sidorova, A. V. Divochiy, Y. B. Vakhtomin, and K. V. Smirnov, “Ultrafast superconducting single-photon detector with a reduced active area coupled to a tapered lensed single-mode fiber,” J. Nanophotonics 9, 093051 (2015). B. S. Robinson, A. J. Kerman, E. A. Dauler, R. J. Barron, D. O. Caplan, M. L. Stevens, J. J. Carney, S. A. Hamilton, J. K. Yang, and K. K. Berggren, “781 Mbit/s photon-counting optical communications using a superconducting nanowire detector,” Opt. Lett. 31, 444–446 (2006). S. Wang, W. Chen, J.-F. Guo, Z.-Q. Yin, H.-W. Li, Z. Zhou, G.-C. Guo, and Z.-F. Han, “2 GHz clock quantum key distribution over 260 km of standard telecom fiber,” Opt. Lett. 37, 1008–1010 (2012). H. Takesue, S. W. Nam, Q. Zhang, R. H. Hadfield, T. Honjo, K. Tamaki, and Y. Yamamoto, “Quantum key distribution over a 40-dB channel loss using superconducting single-photon detectors,” Nat. Photonics 1, 343–348 (2007). A. McCarthy, N. J. Krichel, N. R. Gemmell, X. Ren, M. G. Tanner, S. N. Dorenbos, V. Zwiller, R. H. Hadfield, and G. S. Buller, “Kilometer-range, high resolution depth imaging via 1560 nm wavelength single-photon detection,” Opt. Express 21, 8904–8915 (2013). D. Elvira, A. Michon, B. Fain, G. Patriarche, G. Beaudoin, I. Robert-Philip, Y. Vachtomin, A. V. Divochiy, K. V. Smirnov, G. N. Gol’tsman, I. Sagnes, and A. Beveratos, “Time-resolved spectroscopy of InAsP/InP(001) quantum dots emitting near 2μm,” Appl. Phys. Lett. 97, 131907 (2010). M. J. Stevens, R. H. Hadfield, R. E. Schwall, S. W. Nam, R. P. Mirin, and J. A. Gupta, “Fast lifetime measurements of infrared emitters using a low-jitter superconducting single-photon detector,” Appl. Phys. Lett. 89, 031109 (2006). W. Pernice, C. Schuck, O. Minaeva, M. Li, G. Goltsman, A. Sergienko, and H. Tang, “High-speed and high-efficiency travelling wave single-photon detectors embedded in nanophotonic circuits,” Nat. Commun. 3, 1325 (2012). S. Ferrari, O. Kahl, V. Kovalyuk, G. N. Goltsman, A. Korneev, and W. H. P. Pernice, “Waveguide-integrated single- and multi-photon detection at telecom wavelengths using superconducting nanowires,” Appl. Phys. Lett. 106, 151101 (2015). O. Kahl, S. Ferrari, V. Kovalyuk, G. N. Goltsman, A. Korneev, and W. H. P. Pernice, “Waveguide integrated superconducting single-photon detectors with high internal quantum efficiency at telecom wavelengths,” Scientific reports 5, 10941 (2015). G. A. Steudle, S. Schietinger, D. Höckel, S. N. Dorenbos, I. E. Zadeh, V. Zwiller, and O. Benson, “Measuring the quantum nature of light with a single source and a single detector,” Phys. Rev. A 86, 053814 (2012). M. G. Tanner, C. M. Natarajan, V. K. Pottapenjara, J. A. O’Connor, R. J. Warburton, R. H. Hadfield, B. Baek, S. Nam, S. N. Dorenbos, E. B. Urena, T. Zijlstra, T. M. Klapwijk, and V. Zwiller, “Enhanced telecom wavelength single-photon detection with NbTiN superconducting nanowires on oxidized silicon,” Appl. Phys. Lett. 96, 221109 (2010). A. Korneev, Y. Korneeva, N. Manova, P. Larionov, A. Divochiy, A. Semenov, G. Chulkova, Y. Vachtomin, K. Smirnov, and G. Goltsman, “Recent nanowire superconducting single-photon detector optimization for practical applications,” IEEE T. Appl. Supercon. 23, 2201204 (2013). E. F. C. Driessen, F. R. Braakman, E. M. Reiger, S. N. Dorenbos, V. Zwiller, and M. J. A. de Dood, “Impedance model for the polarization-dependent optical absorption of superconducting single-photon detectors,” Eur. Phys. J-Appl. Phys. 47, 10701 (2009). K. Smirnov, Y. Vachtomin, A. Divochiy, A. Antipov, and G. Goltsman, “Dependence of dark count rates in superconducting single photon detectors on the filtering effect of standard single mode optical fibers,” Appl. Phys. Express 8, 022501 (2015). H. Shibata, T. Honjo, and K. Shimizu, “Quantum key distribution over a 72 dB channel loss using ultralow dark count superconducting single-photon detectors,” Opt. Lett. 39, 5078–5081 (2014). M. G. Tanner, V. Makarov, and R. H. Hadfield, “Optimised quantum hacking of superconducting nanowire single-photon detectors,” Opt. Express 22, 6734–6748 (2014). M. Fujiwara, T. Honjo, K. Shimizu, K. Tamaki, and M. Sasaki, “Characteristics of superconducting single photon detector in DPS-QKD system under bright illumination blinding attack,” Opt. Express 21, 6304–6312 (2013). A. J. Kerman, D. Rosenberg, R. J. Molnar, and A. E. Dauler, “Readout of superconducting nanowire single-photon detectors at high count rates,” J. Appl. Phys. 113, 144511 (2013). M. A. Krainak, X. Sun, G. Yang, L. R. Miko, and J. B. Abshire, “Photon detectors with large dynamic range and at near infrared wavelength for direct detection space lidars,” Proc. SPIE 7320, 732005 (2009). J. Lou, Y. Wang, and L. Tong, “Microfiber optical sensors: A review,” Sensors 14, 5823–5844 (2014). L. Zhang, P. Wang, Y. Xiao, H. Yu, and L. Tong, “Ultra-sensitive microfibre absorption detection in a microfluidic chip,” Lab Chip 11, 3720–3724 (2011). P. Yeh, Optical Waves in Layered Media Hoboken (Wiley, 2005), p.102. A Korneev and et al., “Recent Nanowire Superconducting Single-Photon Detector Optimization for Practical Applications,” IEEE T. Appl. Supercon. 23, 2201204 (2013). Refractive index database, http://refractiveindex.info . A. J. Kerman, D. Rosenberg, R. J. Molnar, and E. A. Dauler, “Readout of superconducting nanowire single-photon detectors at high count rates,” J. Appl. Phys. 113, 144511 (2013). de Dood, M. J. A. Fig. 1 a) Schematic of SSPD consisting of Cu contacts, 4-nm thick NbN meander, and 160 nm thick SiO2, forming a cavity on top of 0.5 mm thick Si substrate. b) SSPD jitter (doted red line) was found to be 62 ps. Jitter has been calculated as a square root of the difference between squared FWHM of the counts histogram (blue curve) and squared nominal laser pulse duration (black line). c) Red dots show spectral sensitivity of SSPD for unpolarized light in the 500–1300 nm range at operating temperature of 4.2 K, measured for the photon flux of 108 photons per second. Black curve shows calculated absorption spectrum of the SSPD with a 160 nm SiO2 cavity. Gray area on the graph shows NV centers emission range. Blue line shows NV center zero-phonon line. d) Quantum efficiency at 633 nm wavelength (colored points) and dark count rate (black points) of SSPD versus detector bias current at operating temperature of 4.2 K. Red, blue and green curves in the inset stand for the cases of optimal polarization giving maximum count rate, unpolarized light and polarization giving minimum count rate, respectively. Bias currents are given in fractions of a critical current Ic, which is measured to be 29 μA. Fig. 2 a) Schematic of experimental setup. b),c) Comparison of g(2)(τ) autocorrelation function obtained by a commercially available APD (b) and an SSPD (c). d) Photoluminescence decay for a single nanodiamond NV center on top of the hyperbolic metamaterial. e) Simulation of the dependence of the g(2) function at τ = 0 on quantum emitter lifetime (see Appendix for more details). Orange line – conventional APD with QE = 0.6 and dark-counts level 1500 cps, jitter 300 ps; green line – idealized APD with dark counts 0.1 cps, black dash doted line – APD with dark counts specified in data sheet. Blue line – SSPD with QE = 0.2, jitter = 0.06 ns, black line – SSPD with high QE = 0.6. Signal-to-noise ratio was chosen to be 100 in order to take into account background compensation procedure (see Appendix). Fig. 3 a) Maximum count rate (blue) and quantum efficiency (red) of the detector at 532 nm wavelength as a function of detector bias current. b) Detector count rate (blue) and effective current (red): experimental data (solid lines) and modeling results (dashed lines); bias current is 0.62 Ic. Green line is for constant voltage regime corresponding to bias current of 0.62 Ic set at 1 MHz count rate. Effective current was measured by exponential fitting of the detector signal decay. c) Detector count rate as a function of input photon rate at 532 nm for different bias current (shown on the plot as a fraction of critical current) d) Next photon detection probability under exposure (bias current is 0.62 Ic, count rate is 123 MHz); dead time is 3 ns; after 10 ns detector is almost fully recovered. Fig. 4 Measured g(2)(τ) from a single NV center on top of hyperbolic metamaterial with APD (a) and SSPD (c). Graphs (a) and (c) represent raw g(2)(τ) measurements, while (b) and (d) – g(2)(τ) measurements after background compensation, which resulted in effective improvement of signal-to-noise from 3 to 100. Fig. 5 Simplified level diagram for incoherent pumped NV center. Fig. 6 Results of g(2)(0) calculations based on the model described for realistic experimental parameters. We made the following assumption about the signal into the detector: an input count rate of 80k counts per second and a noise level of 37k counts per second, giving signal-to-noise ratio of 2.3. a) g(2)(0) versus emitter lifetime. The orange curve represents an estimate for a real APD with dark counts, green corresponds to ideal APD with no dark counts but the same jitter of 350 ps as the real one, while the black dash dotted line represents an APD with dark counts as specified in data sheet. The black and blue lines correspond to the SSPD with and without dark counts. b) Level of g(2)(0) for a given life time of 3 ns versus the quantum efficiency of the detector. SSPD curve was only calculated starting from 0.001 quantum efficiency which is still enough to overcome dark counts with a signal assumed above. (2) g ^ ( 2 ) ( τ ) = 〈 ( S 1 ( t ) + N 1 ( t ) ) ( S 2 ( t + τ ) + N 2 ( t + τ ) ) 〉 〈 S 1 ( t ) + N 1 ( t ) 〉 〈 S 2 ( t + τ ) + N 2 ( t + τ ) 〉 = = g ( τ ) ( 2 ) 〈 S 1 ( t ) 〉 〈 S 2 ( t + τ ) 〉 + 〈 N 1 ( t ) 〉 〈 S 2 ( t + τ ) 〉 + 〈 S 1 ( t ) 〉 〈 N 2 ( t + τ ) 〉 + 〈 N 1 ( t ) 〉 〈 N 2 ( t + τ ) 〉 〈 S 1 ( t ) 〉 〈 S 2 ( t + τ ) 〉 + 〈 N 1 ( t ) 〉 〈 S 2 ( t + τ ) 〉 + 〈 S 1 ( t ) 〉 〈 N 2 ( t + τ ) + 〈 N 1 ( t ) 〉 〈 N 2 ( t + τ ) 〉 . (3) g ( 2 ) ( τ ) = g ^ ( 2 ) ( τ ) × 〈 S 1 〉 〈 S 2 〉 + 〈 N 1 〉 〈 S 2 〉 + 〈 N 2 〉 〈 S 2 〉 + 〈 N 1 〉 〈 N 2 〉 〈 S 1 〉 〈 S 2 〉 − − 〈 N 1 〉 〈 N 2 〉 + 〈 N 1 〉 〈 S 2 〉 + 〈 N 2 〉 〈 S 2 〉 〈 S 1 〉 〈 S 2 〉 , 〈 S i 〉 = 〈 I i 〉 − 〈 N i 〉 , i = 1 , 2.